When a woman finds out she is expecting, usually grandma finds out soon after and the excitement is through the roof! Especially if this is a first grandchild. Usually the support and excitement is well received and shared. After the sweet bundle of joy arrives, grandma wants to be there and help. For new mamas this can feel overwhelming and it can be difficult to navigate where to set boundaries without hurting feelings. Grandmas: this blog is for you. 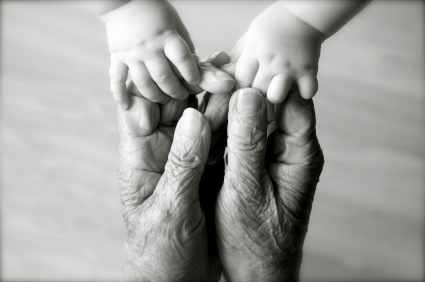 This blog is for your special and sacred role as a grandparent. It is about you supporting your daughter or daughter-in-law during this amazing time. As the years have passed, things have changed and it is important to know what has changed! Holding Babies and Babywearing: I remember my mom saying “If you keep holding that baby so much, you are going to spoil him!”. Babies have been closely held in their mothers womb for 9 months and it is natural and expected for them to want to be held pretty much 24/7. That is why so many people swaddle; it gives the baby the sense that they are being held. Many moms will “babywear”. This give them the option to do other things while also holding their babies. Baby Sleeping: Cry it out no more! It has been shown that newborns that are left to cry can have long lasting effects laster in childhood. Sleep training is not suggested until 6 months of age. Parents can expect that a new baby will not have any sleep schedule at all until at least 6 weeks of age. This ties in with babies loving to be close and held. Bonding: The newborn phase is special and sacred and a beautiful time to bond. Some ways to bond with your new grandchild is spending time with them. In the first two weeks, expect for the parents to be very protective and busy getting to know their new one. This is a time for you to help with meals, cleaning, and watching the siblings if applicable and if you are able. As the weeks pass, you may be invited to watch the baby so their parents can get some time alone, even if it is just an hour. It is statically proven that having grandchildren close and opening time with them with improve health and even longevity! Welcome Baby Care and Health Foundations Birth Center will be hosting a Grandmother’s Tea on February 23rd at 1:30. Tickets are $25 per person. This class is designed to prepare Grandmothers for their role as a grandparent. The topics include sleep, baby-wearing and the latest techniques for developing a strong bond with baby.